Clara Mundt published her works under the pseudonym Luise or Louisa Mühlbach. 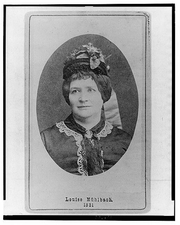 Clara Mundt wrote under the pen name Luise Mühlbach. She was born in Neubrandenburg, Germany, to the large family of Friedrich Müller, a lawyer and politician, and his wife Friederika. Her childhood home was a social center where politicians, government officials, and courtiers met regularly to exchange political views and hold musical events. She received a wide-ranging education and began to write at a young age. After the death of her father, Clara traveled in Switzerland and Italy. She befriended writer Ida Hahn-Hahn, poet Ludwig Tieck, and members of the Young Germans group, who inspired her to become a professional writer. Beginning in 1834, she corresponded with Theodor Mundt, a writer and literary critic, to whom she sent her manuscripts for his review. The couple married in 1839 and had two daughters. At their homes in Breslau and later in Berlin, Clara hosted a salon frequented by artists and writers, aristocrats, and royalty. She made her literary debut with the novel Erste und letzte Liebe (First and Last Love) in 1838. Her contemporaries began referring to her as the "German George Sand" because her early novels were aimed at women and dealt with women's issues such as education, marriage, divorce, and employment, and criticized the exploitation of female workers and the social ostracism of unmarried mothers. In 1849, she published a three-volume fictionalized biography of Aphra Behn. Although she wrote some nonfiction history, she is best known as prolific writer of historical novels. Her books were highly popular and were translated into many languages, including English. Following her husband's death in 1861, she took several trips to the East, including to Egypt and to the inauguration of the Suez Canal. She reported on her travels in detailed articles for German periodicals. Clara Mundt is currently considered a "single author." If one or more works are by a distinct, homonymous authors, go ahead and split the author. Clara Mundt is composed of 23 names. You can examine and separate out names.